Want to send this page or a link to a friend? Click on mail at the top of this window. 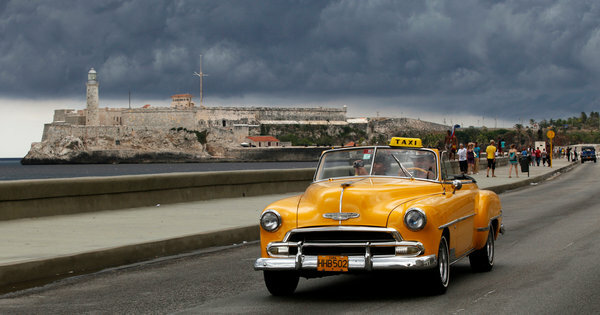 A classic American car drove along the Havana oceanfront in July. HAVANA — Until a few weeks ago, Erik González’s decrepit car did little more than devour his tiny income. He spent hundreds of dollars fixing the car, a 30-year-old Moskvich that his grandfather passed down to him in 2000. Even when it worked, Mr. González could rarely afford to buy gas. Cubans preserved cars, like these taxis, because most could not legally buy autos built after 1959. Before tight regulations were relaxed last month, Cubans had to find ways to keep the old cars they owned running. But now they will be allowed to buy and sell used vehicles freely. A car being repaired on a street in Havana. Then, overnight, the Soviet-made rattletrap became his nest egg. Mr. González put the car up for sale last month when the government published rules allowing Cubans to buy and sell used vehicles freely for the first time in half a century. The axle may be wonky, the carburetor shot, the battery on its last legs and the headlights inoperable, but he believes his royal-blue Moskvich will fetch at least $5,500, a small killing for a waiter whose state salary — before tips and extras — is just $15 a month. Like the new law permitting home sales going into effect this week, the changes headline President Raúl Castro’s efforts to remodel Cuba’s hobbled economy and spur the private sector. After decades in which ownership of such big-ticket items was frozen, the efforts promise to flush money into the market at a time when Cuban officials are trying to stimulate private enterprise and move hundreds of thousands of workers off the public payroll. “The state has no business getting involved in a matter between two individuals,” Mr. Castro told the National Assembly last December, criticizing complex rules and “irrational prohibitions” that he said bred corruption. But like several of Mr. Castro’s other changes, the new law created a pocket of economic liberty in a market that remains tightly controlled. Cubans can purchase and own more than one used vehicle, and they will no longer lose their car if they emigrate. However, the right to buy a new car is still limited to a narrow group of Cubans who earn some foreign currency, including doctors, artists, musicians, members of airline flight crews and the handful of Cubans who work at the American naval base at Guantánamo Bay. “There’s no logic to these rules,” said Leopoldo, a taxi driver who works the road between Havana and Güira de Melena, about 20 miles away, in a shiny 1985 Tatra. He asked that his full name not be used because he feared angering the authorities. Still, the new rules have created a buzz on an island where owning a car is a rare privilege and the number of vehicles per capita is among the lowest in the hemisphere. For-sale signs have begun appearing in car windows. Many people who had bought cars illegally are scrambling to validate the trade. And Revolico, Cuba’s answer to Craigslist, is replete with people promising to pay tens of thousands for a used Hyundai or Kia. But the tight grip on imports means cars will remain scarce and command eye-popping prices, whatever their condition, economists and car brokers say. “A car that in another country you’d pay to destroy, you can sell here for $14,000,” said Paul Gómez Valladares, a mechanic who was fixing the bushings on a 1996 Lada Combi in a workshop shaded by mango trees. Previously, Cubans could only legally trade cars that predate the 1959 revolution, hence the iconic American cars that still cruise the island’s roads. But those are only a small fraction of the nation’s used cars. Islanders bought and sold cars on the sly, but it was a risky business that put off people like Mr. González and made buyers wary of paying large sums for a vehicle they would not legally own. Emilio Morales, president of the Miami-based Havana Consulting Group, said the new rules — like earlier decisions to let Cubans own cellphones and computers or work in the private sector — simply legalized what many Cubans were already doing illicitly and would neither increase Cuba’s antiquated stock of vehicles nor alleviate the country’s crushing transportation problem. The move was intended to placate people, not stimulate the economy, Mr. Morales said. “This is one of their political pressure valves,” he said. While Mr. Morales, a senior executive at the huge Cuban state-owned company Cimex until 2006, acknowledged that the government did not yet have the infrastructure to organize a full-scale car market, he argued that it was most likely also reluctant to unsettle a longstanding system of privilege that rewarded workers in certain sectors. Tight controls on imports have produced a curious — and sparse — mix of traffic that reflects Cuba’s communist history. Oldsmobiles and Plymouths that are relics of the country’s capitalist past now operate as taxis, a lucrative niche in Cuba’s budding private sector. Luxury S.U.V.’s, driven by foreigners or by the artists and musicians who belong to the new economic elite, zip past Soviet cars that in the 1970s and 1980s were used to reward good workers or loyal functionaries. Despite decades of communist prohibitions, the capitalist instincts of those playing the car market seem to be thriving. The state charges $28,000 for a new Hyundai Accent. But a Cuban lucky enough to get a permit to buy one can then resell it for about $10,000 more on the used-car market, according to one broker. The permit alone can sell on the black market for $4,000 to $10,000, according to car owners, mechanics and brokers. Such prices seem outlandish in a country where the average monthly wage is about $20 (though people receive free health care, education and other subsidies). But economists and brokers say there is a community of flush car buyers who receive money from relatives overseas, or from successful private businesses, farming or black market trade. Alexis, a broker near Havana, said more Cubans living overseas were buying cars in their relatives’ names to use when they visited the island. For Fidel Alfonso, who struggles to keep his 1949 Plymouth on the road, the enormous premium on a “modern” vehicle — that is, one made in the past 10 to 15 years — means he is condemned to forever drive a rust-bucket. Mr. González, the Moskvich owner, is not waiting to find out. He said he would use the proceeds to build a new kitchen and fix up his house in a gritty Havana suburb, and then put some money aside for a restaurant he hoped to open with friends. Copyright 2011 The New York Times Company. Reprinted from The New York Times, International, of Sunday, November 6, 2011.